← Perez Chipman Sr. & Perez Chipman Jr.
A. Tornado: A deadly natural disaster! The Midwest portion of the United States has the worst tornadoes in the world, with Kansas and Oklahoma being the two most affected states, while Mississippi, Alabama, Arkansas, and North Texas following follow closely behind. In an average year, 800 tornadoes are reported nationwide. Tornadoes can happen any time of the year and any time of day. In the southern states, peak tornado season is from March through May. Peak times for tornadoes in the northern states are during the summer. A few southern states have a second peak time for tornado outbreaks in the fall. Tornadoes are most likely to occur between 3 p.m. and 9 p.m. Conduct tornado drills each tornado season. Practice getting to your shelter from different areas of the house. Practice this at night, as well as during the day. Practice with your pets, if you have any, so they too can become comfortable with the escape plan. • An approaching cloud of debris can mark the location of a tornado even if a funnel is not visible. • Before a tornado hits, the wind may die down and the air may become very still. • Tornadoes generally occur near the trailing edge of a thunderstorm. It is not uncommon to see clear, sunlit skies behind a tornado. 2) Put an emergency supply kit together. camera and film for recording the damage after the tornado. DO NOT attempt to take pictures of the tornado! tornadoes are unpredictable and deadly! Give first aid when appropriate. Don’t try to move the seriously injured unless they are in immediate danger of further injury. Call for help. Take pictures of the damage–both to the house and its contents– for insurance purposes. Remember to help your neighbors who may require special assistance– infants, the elderly, and people with disabilities. Check for gas leaks–If you smell gas or hear a blowing or hissing noise, open a window and quickly leave the building. Turn off the gas at the outside main valve if you can and call the gas company from a neighbor’s home. If you turn off the gas for any reason, it must be turned back on by a professional. Check for sewage and water lines damage–If you suspect sewage lines are damaged, avoid using toilets and call a plumber. If water pipes are damaged, contact the water company and avoid using water from the tap. You can obtain safe water by melting ice cubes. Some damage to chimneys; break branches off trees; push over shallow-rooted trees; damage to sign boards. Category F1, Moderate tornado, (73-112 mph) Moderate damage. Category F2, Significant tornado, (113-157 mph) Considerable damage. Roofs torn off frame houses; mobile homes demolished; boxcars pushed over; large trees snapped or uprooted; light-object missiles generated. Roofs and some walls torn off well-constructed houses; trains overturned; most trees in forest uprooted; heavy cars lifted off ground and thrown. Well- constructed houses leveled; structure with weak foundation blown off some distance; cars thrown and large missiles generated. Strong frame houses lifted off foundations and carried considerable distance to disintegrate; automobile sized missiles fly through the air in excess of 100 yards; trees debarked; incredible phenomena will occur. Look below to see how Storm Shelters manufactured from inferior materials compare! (RNN) – As the death toll keeps rising, a destructive storm that swept through the Southeast and killed more than 350 people is so far the second deadliest tornado outbreak in U.S. history. Authorities and FEMA administrators said the fatality numbers from the devastating severe storms across the South have climbed to 354. The largest death toll was on March 18, 1925, with 747 people being killed by storms that ripped through Missouri, Illinois and Indiana. Thousands have been injured, and untold more have been left homeless, hauling their belongings in garbage bags or rooting through disgorged piles of wood and siding to find anything salvageable. While Alabama was hit the hardest, the storm spared few states across the South. Thirty-four people were reported dead in Tennessee, 33 in Mississippi, 15 in Georgia, 7 in Virginia and one in Kentucky. With search and rescue crews still climbing through debris and making their way down tree-strewn country roads, the toll is expected to rise. [Top image: April 27th tornado tracks shown on US map. President Obama announced that he was coming to Alabama on Friday afternoon, saying in a statement that the federal government had pledged its assistance. Gov. Robert Bentley toured the state by helicopter along with federal officials, tracking a vast scar that stretched from Birmingham to his hometown, Tuscaloosa. He declared Alabama “a major, major disaster.” “As we flew down from Birmingham, the track is all the way down, and then when you get in Tuscaloosa here it’s devastating,” Mr. Bentley said at an afternoon news conference, with an obliterated commercial strip as a backdrop. An enormous response operation was under way across the South, with emergency officials working alongside churches, sororities and other volunteer groups. In Alabama, more than 2,000 National Guard troops have been deployed. Across nine states, more than 1,680 people spent Wednesday in Red Cross shelters, said Attie Poirier, a spokeswoman with the organization. The last time the Red Cross had set up such an elaborate system of shelters was after Hurricane Katrina, a comparison made by even some of those who had known the experience firsthand. “It reminds me of home so much,” said Eric Hamilton, 40, a former Louisianan, who was sitting on the sidewalk outside the Belk Activity Center, which was being used as a Red Cross shelter in south Tuscaloosa. Officials at the National Weather Service Storm Prediction Center said they had received 137 tornado reports on Wednesday, with 104 of them coming from Alabama and Mississippi. Over all, there have been 297 confirmed tornadoes this month, breaking a 36-year-old record. Southerners, who have had to learn the drill all too well this month, watched with dread on Wednesday night as the shape-shifting storm system crept eastward across the weather map. Upon hearing the rumble of a tornado, or even the hysterical barking of a family dog, people crammed into closets, bathtubs and restaurant coolers, clutching their children and family photos. Many of the lucky survivors found a completely different world when they opened their closet doors. “We heard crashing,” said Steve Sikes, 48, who lives in a middle-class Tuscaloosa neighborhood called the Downs. “Then dirt and pine needles came under the door. We smelled pine. “When you smell pine,” he said, gesturing, by way of a conclusion, toward a wooden wreck behind him, so mangled that it was hard to tell where tree ended and house began. Some opened the closet to the open sky, where their roof had been, some yelled until other family members pulled the shelves and walls off them. Others never got out. 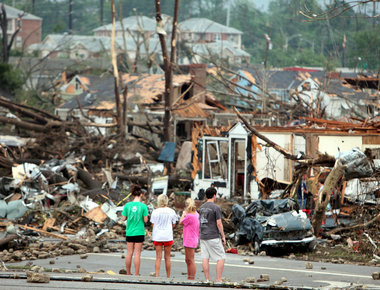 Internet images from various states struck by the April 27th tornados. Carter avoided becoming a victim, but authorities say the South has been plagued by a variety of swindles since the twister outbreak last week that ripped apart houses and killed 329 people in seven states. Looters have carried off televisions, power tools and prescription pills. Elsewhere, there are unscrupulous businesses are charging double for a tank of gas or jacking up the cost of a hotel room. Authorities also warn of construction workers who leave with the cash before opening their tool kit and the danger that identities could be stolen off wind-blown documents. Some residents are packing firearms to scare off the lowlifes. In Alabama, Mike Capps was guarding his parents’ house over the weekend with an M-1 carbine rifle. Capps, 41, said he returned to the site the day after Wednesday’s tornadoes, leaving his parents in the hospital. Walking up Dogwood Lane, he saw a man carrying a rolled-up power cord that looked familiar. Then he noticed the cord had his own name on it. “I said, ‘If your conscience will let you live with what you just did, then you’ve earned that cord.’ And he kept on walking,” Capps said. Later Capps noticed a group — six adults with children — on the far side of the lot, going through a plastic bag of his mother’s prescription bottles. They were shaking them to see which held pills. “What are you doing in my house? It’s time to go,” Capps says he told them, and the group complied. In nearby Birmingham, looters took a woman’s flat screen TV off her wall, while to the west thieves swiped a $150 saw from the remains of Claude Patterson’s welding shop, his livelihood. Elsewhere, stolen items have included the equipment utility companies are using to try to restore power. Police in several of the states have charged people with looting, though officials said they aren’t keeping statewide numbers on those arrests. Tuscaloosa’s mayor on Wednesday ordered five more days of an 8 p.m. curfew to curb crime in the most heavily damaged areas, to be enforced by police and National Guard troops. The city that was hit the hardest by the outbreak is also going to start credentialing volunteers to prove they are legitimate. their prices and unfair gasoline prices. Just across the border in Tennessee, authorities were investigating a complaint that a service station was charging $40 for $20 worth of gasoline. Both states have laws against price-gouging. In Alabama, businesses are prohibited after disasters from increasing the price of items for sale or rent by 25 percent or more above the average price charged in the same area within the last 30 days. Dozens of Tennessee gasoline stations were charged with price gouging following Hurricanes Ike and Gustav in 2008. Settlements totaled more than $175,000. Among the cruelest scams has been criminals impersonating relief workers to steal from tornado survivors. Authorities in Alabama’s northern Lawrence County have charged three men and a woman with that crime. Rusty Snyder, 34, said he was stunned by how quickly the thieves moved in after Wednesday’s storms. “It happened at 8:45 at night, and by 10 there were looters,” he said. Thanks for the concise report on preparation for the power of nature. We had a freak tornado at our lake 6 years ago. A tornado came across from the southwest 3 houses west of us pulling off siding, shutters, and lifting their boat lift with boat out of the lake and flipped upside down across the lake. A swath of trees were snapped 20 feet above ground and this path went for 20 miles. Timer was cleared for 3 months to avoid fire hazard of downed trees.